Azure Ray is a weird concept in 2010, a duo that had a real importance in 2003-2004, just as the saddle creek was crossing over into mainstream crediblity, the likes of Bright Eyes, Rilo Kiley and Cursive enhanced the Omaha, NE scene as the hottest place in the world to make music. Azure Ray could have been the right hand woman to Conor Oberst/Mike Mogis' possessive baby, but instead they split to focus on their respective solo projects/other bands, and Azure Ray was left to be featured on countless TV Shows and live on many peoples love but never seen live lists. Maria Taylor was arguably the more successful of the two, with three solo albums which saw her featured and quite highly on Grey's Anatomy (which has in the states launched several high profile acts) and tour the world with varying degrees of popularity with each album being more pop than the previous one. Orenda Fink's solo projects were more daring and varied, the question is do Azure Ray have a place in 2010, as many people have done what they did in varying degrees since their initial break through, (compare in part to this week's album of the week Warpaint for an example of a band which feature on Azure Ray's historical importance), Drawing Down The Moon succeeds because it's very knowing and even responds to their limitations within the confines of the song as they sing on Silver Sorrow "what we do, we do the best that we can..." and they acknowledge their TV exposure with a wink and a smile. Drawing Down The Moon is an incredibly split album, rising to each woman's obvious strengths, Maria is left with some of the more upbeat but conversely bitter pop songs ("Don't Leave My Mind", sounds like a lot of the songs from Taylor's three solo albums) while Orenda's are more dreamlike and experimentally arranged, with broken beat percussion and haunting harmonies ("In The Fog's" soaring duet over the static feedback beat.) Azure Ray do what they do very well, no-one can create haunting female popsongs as well as they can and the Taylor/Fink combination has not been bettered over the previous eight years, ("Larraine" is the perfect example of the abilities of building a sinister ballad). 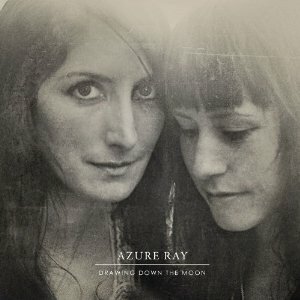 But sadly, it also feels a little too late for Azure Ray to really get the appreciation that many who came after them got instead, but "Drawing Down The Moon" is an album created with love and tears and hurt feelings, and thus it has the ablitity to make you laugh and cry quite like any album you've heard this year, if you don't feel tingles on "On and On again" as Taylor sores above the wild synth or your foot doesn't tap during the warm country patter of "Make Your Heart" or the heartbreaking opening verse on "Signs in the Leaves" "I'm a little worried that I killed something inside of me when I let you go/Days were dark with you in my mind, I thought it best to be free, but now the birds don't sing and the trees dont speak and I dont see signs in the leaves anymore.